Asset tracking, Indoor analytics and Maps. Steerpath offers indoor positioning and indoor navigation across industries and types of venues. Our Bluetooth beacon based indoor positioning and wayfinding work reliably in different environments. Our platform for indoor tracking works without wires and helps you track assets and people inside a buildings in real time. Our indoor navigation system, asset tracking and analytics solutions are used by companies spanning from airports to hospitals, from university campuses to offices. Steerpath now powers applications all around the world, including Singapore Changi Airport. Steerpath's technology is available as an indoor positioning SDK and can be integrated with ease to any existing system. Get the same experience you get with GPS also indoors. Beautiful indoor and outdoor maps with your design. Digital wayfinding with turn-by-turn navigation for your app, interactive kiosks and website. Asset tracking allows you track people and objects. Analyse how your customers are using your space. Steerpath indoor positioning provides accurate location services to all iOS and Android devices with Bluetooth. You can think indoor positioning system as an accurate GPS for indoors. Steerpath indoor positioning is used by Airports, hospitals, offices and expo centers. Steerpath indoor positioning system is designed to work in all environments without need for calibrations. Typical accuracy of the system is 2-5m. Beautiful modern maps that cover both indoors and outdoors. The same experience on all platforms and even with your custom brand look. As the user zooms in, more details such as furniture can be revealed. When zoomed out the global map comes into view. Keep your venue maps always up to date on your mobile app, web site and interactive screens with Steerpath map platform! 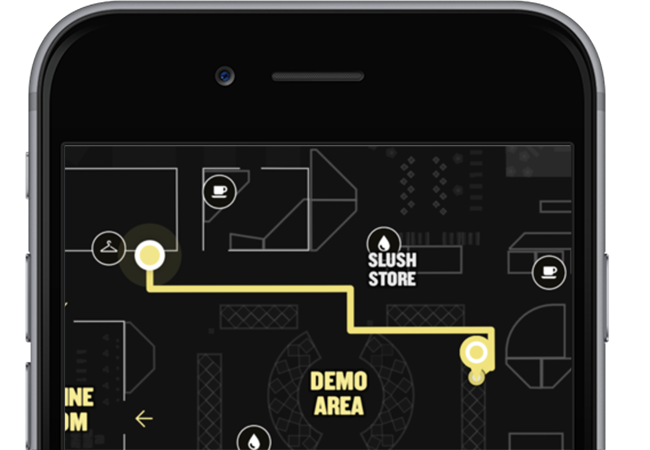 With Steerpath wayfinding SDK in your mobile app, website and interactive screens, your visitors can find their way around your venue with ease. It supports many different use cases, from navigating to your connecting flight in an airport to finding a room in a hospital. The Steerpath Asset Tracking solution leverages the power of indoor positioning of people and objects and allows for cost efficient tracking that works both indoors and outdoors. The Steerpath indoor analytics system automatically gathers metrics on how your customers use your space a. If the your organization uses a business intelligence application (Tableau, Microsoft Power BI etc.) the data produced by the Steerpath solution can be exported to it.